Phase Change Material Composites for Energy Storage – Makita R. Phillips, Ph.D. The increased demand for dynamic thermal management in systems with low (chip testing) and high (large-format battery systems) heat fluxes necessitates a scalable approach to deliver consistent performance. Phase change materials (PCM) for cooling are selected based upon the threshold temperature (Tmax) of the device and its proximity to the melting and solidification temperature of the PCM. Additionally, the thermal conductivity of the PCM can be increased using a heat spreader, nanoparticles, or additional methods to improve performance. My work explores a vertically aligned carbon nanotube (CNT)-PCM composite that couples the high thermal conductivity of the CNTs and high latent heat of the PCM . 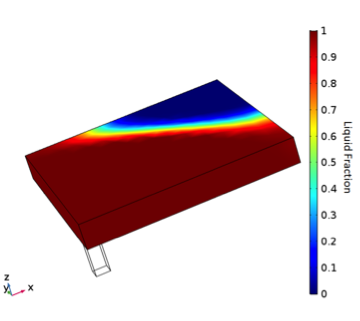 I developed an experimentally verified numerical model to explore the contributions of various geometric configurations and compare the composite performance to a traditional aluminum heat sink. A smaller composite volume is able to reduce the temperature rise of an electronic device compared to the traditional heat sink. This is attributed to the composite’s specific heat, which is 10-25x greater than the aluminum heat sink, which results in significant weight savings and a reduction in overall system volume. Phillips, M. R., Green, C. E., and Cola, B. A., 2018, “Numerical and Experimental Investigation of Vertically Aligned Carbon Nanotube-Phase Change Material Composites for Thermal Management of Electronics,” 2018 17th IEEE Intersociety Conference on Thermal and Thermomechanical Phenomena in Electronic Systems (ITherm), pp. 141–146.